With the rapidly changes on industries and information technologies in recent years, some traditional bulk electronic appliances have to be monitored for a long time. All of their control devices such as communication interfaces gradually enter the Intemet information era. The control of all equipment has been performed through the use of computers. Most equipment uses PLC to connect with computers to monitor each load and electricity consuming devices. Programmable Logic Controllers (PLC) are widely used in industrial control because they are inexpensive, easy to install and very flexible in applications. A PLC interacts with the external world through its inputs and outputs. Generates outputs to output modules based on the control logic solutions. Input devices and output devices of the process are connected to the PLC and the control program is entered into the PLC memory (Fig.1). In our application, it controls through analog and digital inputs and outputs the varying load-constant speed operation of an induction motor. Also, the PLC continuously monitors the inputs and activates the outputs according to the control program. This PLC system is of modular type composed of specific hardware building blocks (modules), which plug directly into a proprietary bus: a central processor unit (CPU), a power supply unit, input-output modules I/O and a program terminal. Such a modular approach has the advantage that the initial configuration can be expanded for other future applications such as multi machine systems or computer linking . The software models generated in the Software Requirements Analysis phase of the development project are refined and embellished in the design phase of the project. This phase involves making implementation decisions such as the interfacing between different software modules, the break down of software across multiple processors, assigning inputs and outputs to I/O cards, etc. PLC software, once written must be easy and intuitive to follow. PLCs are an integrated part of the domain system, advances in the technology of the system will effect the requirements of the PLC software. PLC software must therefore be maintainable and extensible . In Fig. 2, the block diagram of the experimental system is illustrated. The following configurations can be obtained from this setup. A closed-loop control system for constant speed operation, configured with speed feedback. The induction motor drives a variable load, is fed by an inverter and the PLC controls the inverter output. An open-loop control system for variable speed and variable frequency operation. The induction motor drives a variable load and is fed by control mode. The PLC is an inverter in constant in activated. The standard variable speed operation. The induction motor drives a variable load and is fed by a constant voltage-constant frequency standard three-phase supply. The open-loop configuration (2.) can be obtained from the closed-loop configuration (1.) by removing the speed feedback. On the other hand, operation c) results if the entire control system is bypassed. 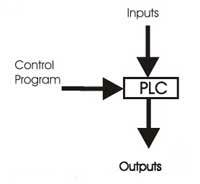 [6-7] PLC’s programming is based on the logic demands of input devices and the programs implemented are predominantly logical rather than numerical computational algorithms. Most of the programmed operations work on a straightforward two-state “on or off” basis and these alternate possibilities correspond to “true or false” (logical form) and“ 1 or 0” (binary form), respectively. Thus, PLCs offer a flexible programmable alternative to electrical circuit relay-based control systems built using analog devices. The programming method used is the ladder diagram method. 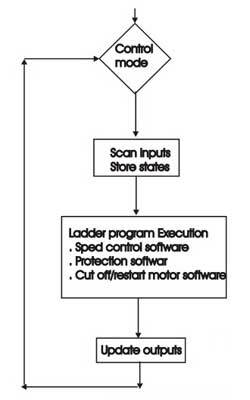 The PLC system provides a design environment in the form of software tools running on a host computer terminal which allows ladder diagrams to be developed, verified, tested, and diagnosed. First, the high-level program is written in ladder diagrams. Then, the ladder diagram is converted into binary instruction codes so that they can be stored in random-access memory (RAM) or erasable programmable read-only memory (EPROM). Each successive instruction is decoded and executed by the CPU. The function of the CPU is to control the operation of memory and I/O devices and to process data according to the program. Each input and output connection point on a PLC has an address used to identify the I/O bit. The method for the direct representation of data associated with the inputs, outputs, and memory is based on the fact that the PLC memory is organized into three regions: input image memory (I), output image memory (Q), and internal memory (M). Any memory location is referenced directly using %I, %Q, and %M (Table III). The PLC program uses a cyclic scan in the main program loop such that periodic checks are made to the input variables (Fig.3). The program loop starts by scanning the inputs to the system and storing their states in fixed memory locations (input image memory I). The ladder program is then executed rung-by-rung. Scanning the program and solving the logic of the various ladder rungs determine the output states. The updated output states are stored in fixed memory locations (output image memory Q). The output values held in memory are then used to set and reset the physical outputs of the PLC simultaneously at the end of the program scan. For the given PLC, the time taken to complete one cycle or the scan time is 0, 18 ms/K (for 1000 steps) and with a maximum program capacity of 1000 steps. 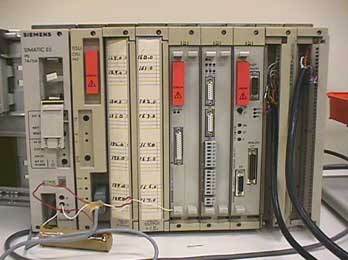 The development system comprises a host computer (PC) connected via an RS232 port to the target PLC. The host computer provides the software environment to perform file editing, storage, printing, and program operation monitoring. The process of developing the program to run on the PLC consists of: using an editor to draw the source ladder program, converting the source program to binary object code which will run on the PLC’ s microprocessor and downloading the object code from the PC to the PLC system via the serial communication port. The PLC system is online when it is in active control of the machine and monitors any data to check for correct operation. 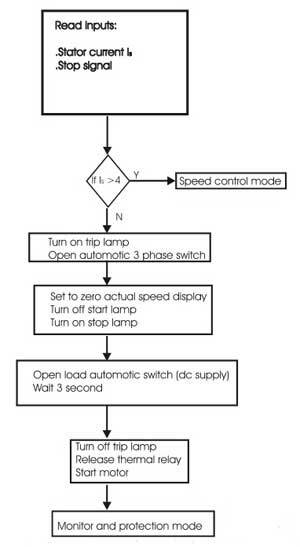 In Fig.4, the flowchart of the speed control software is illustrated. The software regulates the speed and monitors the constant speed control regardless of torque variation. The inverter being the power supply for the motor executes this while, at the same time, it is controlled by PLC’ s software. The inverter alone can not keep the speed constant without the control loop with feedback and PLC. From the control panel, the operator selects the speed set point nsp and forward/backward direction of rotation. Then, by pushing the manual start pushbutton, the motor begins the rotation. If the stop button is pushed, then the rotation stops. The corresponding input signals are interfaced to the DIM and the output signals to the DOM. The AIM receives the trip signal from the stator current sensor, the speed feedback signal from the tacho-generator, and the signal from the control panel. In this way, the PLC reads the requested speed and the actual speed of the motor. The difference between the requested speed by the operator and the actual speed of the motor gives the error signal. If the error signal is not zero, but positive or negative, then the PLC according to the computations carried out by the CPU decreases or increases the V/f of the inverter and, as a result, the speed of the motor is corrected. The implemented control is of proportional and integral (PI) type (i.e., the error signal is multiplied by gain Kp, integrated and added to the requested speed). As a result, the control signal is sent to the DOM and connected to the digital input of the inverter to control V/f variations. At the beginning, the operator selects the gain Kp, by using a rotary resistor mounted on the control panel (gain adjust) and the AIM receives its voltage drop as controller gain signal (0–10 V). The requested speed nsp is selected using a rotary resistor and the AIM reads this signal. Its value is sent to the AOM and displayed at the control panel (speed set point display). Another display of the control panel shows the actual speed computed from the speed feedback signal. In Fig. 5, the flowchart of this software is shown. During motor operation, it is not possible to reverse its direction of rotation by changing the switch position. Before direction reversal, the stop button must be pushed. For motor protection against overloading currents during starting and loading, the following commands were programmed into the software. 2. 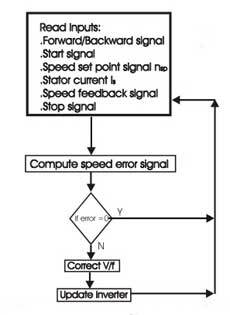 Speed set point signal nsp, the stator current IS and the speed feedback signal are input to AIM. 3. At no load, Is ≤ 2,5 A, if the speed set point is lower than 20% or nsp< 300 r/min, the motor will not start. 4. At an increased load over 3,2 Nm (40% of rated torque), Is ≥ ,3 A and a speed set point lower than 40% or nsp< 600 r/min, the motor will not start. 5. If the load is increased more than 8,0Nm (rated torque) Is ≥ 4 A and if the speed set point exceeds 100% or nsp≥ 1500 r/min, the motor enters the cut off procedure. 6. In all other situations, the motor enters in the speed control mode and the speed control software is executed as described in Subsection A. In Fig. 6, the flowchart of this software is shown. In overloading situations, the motor is cut off and the trip lamp (yellow) is lit. The operator must release the thermal relays and then must turn off the trip lamp by pushing trip or stop button. The thermal relays are set to the motor rated current 4 A. Following this, the motor can be started again. The motor can be cut off by the operator pushing the stop button: the display of the actual speed is set to zero, the start lamp (green) turns off, and the stop lamp (red) turns on and remains lit for 3 s.
The load must be disconnected immediately after the motor cuts off and before the drive system is restarted. The motor will not start before 3 s after cutoff even if the start button is pushed. The range of load torque and of speed corresponds to the design of the PLC hardware and software as described in the previous sections. The speed versus torque characteristics were studied in the range 500–1500 r/min and are illustrated in Fig. 7. The results show that configuration b) operates with varying speedvarying load torque characteristics for different speed set points nsp. Configuration (1.) operates with constantspeed-varying load torque characteristics in the speed range 0–1400 r/min and 0–100% loads. However, in the range of speeds higher than 1400 r/min and loads higher than 70%, the system operates with varying-speedvarying-load and the constant speed was not possible to be kept. Thus, for nsp ≥ 1400 r/min both con-figurations (1.) and (2.) have a similar torque-speed response. This fact shows that PI control for constant speed as implemented by the software with PLC is effective at speeds lower than 93% of the synchronous[4-7]. The efficiency for different values of nsp was also studied. As depicted in Fig. 8, the results show that configuration (1.) 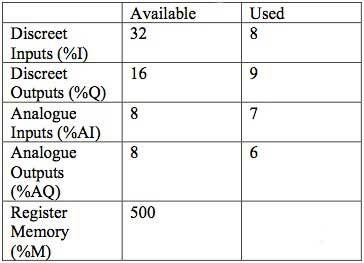 in all cases has a higher efficiency than configuration (2.). Also, at operation with loads higher than 70%, the normalized efficiency is η(pu)> 1, meaning that the obtained efficiency with PLC control is higher than the efficiency of induction motor operated from the standard 380-V, 50-Hz network without the control of PLC and without the inverter. 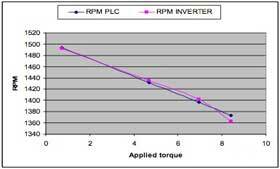 where is the slip and Rs and Rr are the stator and rotor winding resistances, respectively. As can be seen from Fig. 7, the PLC controlled system a) works with very low slip values, almost zero. In all speed and load torque conditions, the configuration (1.) has a smaller slip than configuration (2. ), thus the higher values of efficiency can be justified and especially at high speeds and frequencies. At lower frequencies, the magnetic flux increases and, thus, there is an increase in magnetizing current resulting in increased losses. This system presents a similar dynamic response as the closed-loop system with V/f speed control. Its transient performance is limited due to oscillations on torque and this behavior restricts the application of this system to processes that only require slow speed variation. 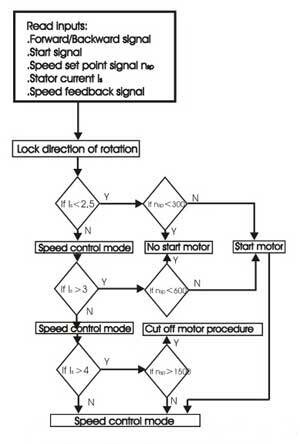 Successful experimental results were obtained from the previously described scheme indicating that the PLC can be used in automated systems with an induction motor. 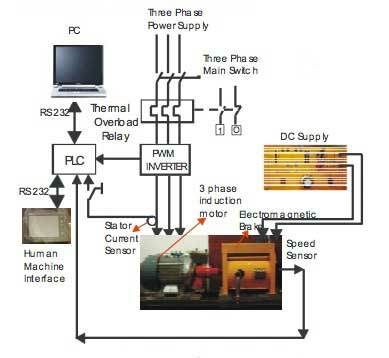 The monitoring control system of the induction motor driven by inverter and controlled by PLC proves its high accuracy in speed regulation at constant-speedvariable-load operation. The effectiveness of the PLC-based control software is satisfactory up to 96% of the synchronous speed. 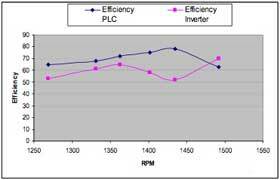 The obtained efficiency by using PLC control is increased as compared to the open-loop configuration of the induction motor fed by an inverter. Specifically, at high speeds and loads, the efficiency of PLC-controlled system is increased up to 10–12% as compared to the configuration of the induction motor supplied from a standard network. Thus, the PLC proved to be a versatile and efficient control tool in industrial electric drives applications.